I've seen four Guillermo del Toro movies in my time: Blade II, the Hellboy Duology, and Pan's Labyrinth. But I've never seen any of his early Spanish-language horror stuff, from the old days when he was an up-and-coming Mexican horrorsmith. I've only seen the stuff that's happened since he became a name and the studios gave him a budget. Last year I tackled The Orphanage, which he produced and so I figured now would be a very good time to see his early work, The Devil's Backbone. 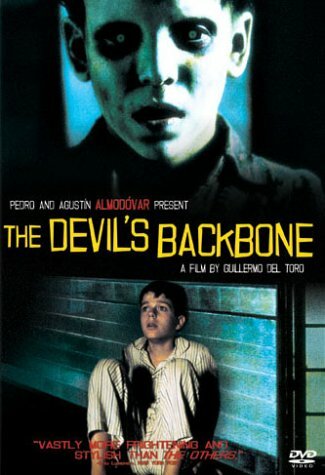 Devil's Backbone is set during the Spanish Civil War and opens with Carlos, the son of a fallen Republican officer being brought to a remote orphanage that serves as a home for the children of dead freedom fighters. Upon arriving, Carlos notices the strange fear the other boys live in of "He Who Sighs", the local ghost. Soon, amidst the backdrop of an encroaching fascist victory in the outside conflict, the eerie hauntings and staff intrigue come to a head, and Carlos discovers that the ghost is almost as recent a resident as he is. Devil's Backbone isn't as straightforward a horror movie as many of the others I've watched, a "gothic drama" might be a better description. There are very few "Boo!" moments considering this a ghost story. Santi, the restless spirit in question, pops up more as an eerie presence than as a scare tactic. The movie serves more as a tale of lost innocence amid historical drama with supernatural elements than as a study in terror. Though on the other hand, how narrow a definition do we ascribe to "horror" movies anyway? But was it scary? As stated before, this is about as scary as any Spanish Civil War drama you've seen (it serves as a great companion piece to Pan's Labyrinth) and unless children in peril terrify you, you'll probably come out alright.